Sometimes you need to completely know about your computer before installing any software or peripheral if you purchased any software without knowing your system configuration it might not get installed because some software has a different version for different windows and system type (32 bit & 64 bit). Hardware configuration is an important thing which you need to know, many software programs require high RAM and CPU usages if you don’t know what software you are installing on which hardware you may face incompatibility issue. So here are different ways to get your complete System Information. Hardware configuration is an important thing which you need to know, many software programs require high RAM and CPU usages if you don’t know what software you are installing on which hardware you may face incompatibility issue. So here are different ways to get your complete System Information. How to Know Basic System Information of your Computer. 2. From Right Click options Click on “Properties” and it will open “System“. Here you will get Basic System Information. 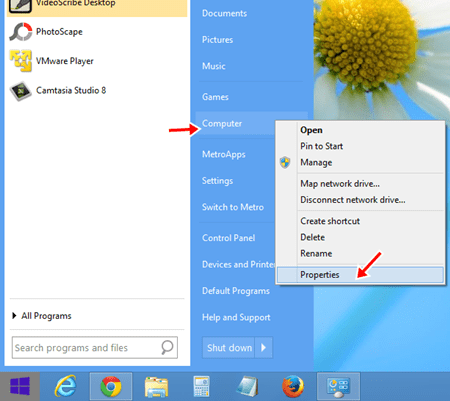 If you are windows 8.1 or Windows 10 user then open This PC where drives are listed, right click on blank area and click properties. How to Get Detailed Information about your computer. Basic information helps a lot when you install any software and you want to know whether a Computer has 32 bit or 64 bit operating system or you just want to check processor or RAM, but if you want to know much about any windows system like Hardware, Hardware Resources, Component and Software resources you need to access “System Information” area of your computer. To Access System Information there are following methods. Method 1. Press Windows button + R and it will open run dialog box, now type “msinfo32” and click on Ok. Method 2. Go to Start and open Control Panel from control panel look for “Administrative tools” and open it, you will get System Information here. Once you open System Information you will get all the details of your computer. Hardware Resources tell about various hardware resource used in computer like Input/Output, DMA, Memory etc basically it provide info about various ports and uses. Component tells about the various component of a computer and their properties. Different components are Multimedia, CD-ROM, Sound, Display, Modem, Network, Ports, Storage, USB Etc once you click on any of these components it will show you their detailed information. Software Environment tells about System Drivers, Environment Variables, Print Job, Network Connections, Running Tasks, Services, Startup Programs, Windows Error Reporting etc. These System Info are important if you are responsible for installing, troubleshooting and managing computer systems. Also, there are few software programs available which tell the System information one of them is System Information Viewer.